The main problem with these and other simplistic slogans is their failure to grasp the contextual complexity of the issue. Although America may well be a country devoted to smaller government, in practice, we have created a country with large numbers of governments. The 2012 Census of Governments identified 90,107 within a mixture of jurisdictions at the federal, state and local levels. Which of these governments were our leaders addressing and which ones were ‘the problem’ or too big and if so, deserving of being “drowned in the bathtub?” These populist notions have remained largely unchallenged in the public’s mind, arguably, to the detriment of the profession of public administration. This second in a series of monthly articles, presents an attempt to rebuild understanding of the value of government, focused where the American experiment first began, at the local level. Fast forward to today where over 90,056 local governments serve Americans every day. The 2012 Census of Governments includes five classifications within two distinct categories based on their overall scope of authority. According to their Government Organization Summary Report, general purpose governments include 19,519 municipalities, 16,360 townships, and 3,013 counties which perform a “number of functions which include financial administration, police protection, highway administration, hospitals, etc.” Special purpose governments have 12,880 school districts and 38,266 special districts which “perform one function or a very limited number of functions that include “public education, mosquito abatement, water and sewer services, transit authorities, etc.” The report stated that 14 million Americans were employed in local governments. 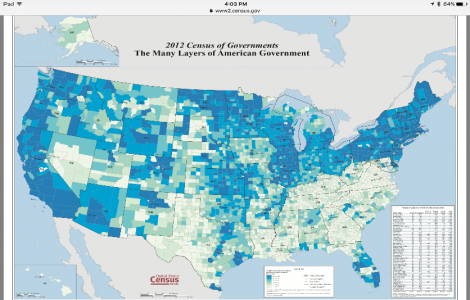 The 2012 Census of Governments map of The Many Layers of American Government shows their location by county, with dark blue being the highest number scaled to white for the lowest number. But at the local level, two largely unnoticed administrative processes have to been in play long before the condemning pronouncements were uttered; consolidation and cost containment. First, according to the US Census’ Statistical Abstract, there were 81,780 local governments in 1982, a significant reduction in the number of entities based on a high of 155,067 in 1942. The decline was mainly due to school district consolidations over the forty year period. Second, according to the US Census of Government: Summary Report of 2012, the overall payroll of local governments had increased by 9.6 percent since 2007, roughly 2 percent per year. This was significantly lower than the federal government at 16.9 percent and all state governments at 13.4 percent. As these trends demonstrate, local governments continue to adapt and serve, led by sound management principles imbedded in public administration. Subsequent articles will delve more deeply into the details of its value.